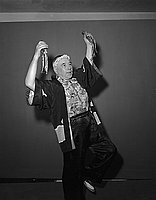 Walter S. Spellman, 60 year old bachelor who has danced in Nisei Week in Little Tokyo since 1948, dances odori in happi coat, black satin pants, and hachimaki headband, Los Angeles, California, August 28, 1955. Caucasian man faces right, raising both arms above his hands with proper left knee raised. He holds wooden clappers, or kachi kachi, in his hands. Typed on original negative envelope: Spellman, Mr..